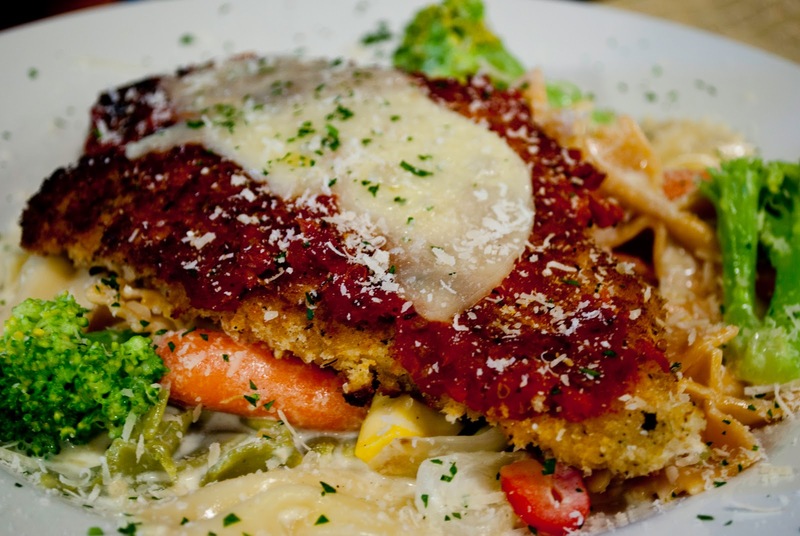 Our Chicken Parmesan is a fall favorite here at the Inn Above Onion Creek Bed and Breakfast. It's our way to bring a bit of Tuscany to the Texas hill country. 1. Sweat the onion, carrot, and celery (without browning) in a skillet with a tablespoon of olive oil. Add the garlic, and continue to cook for a minute or so. Be careful not to brown the garlic, or the sauce will have a slight bitterness to it. Add the tomatoes, tomato paste, thyme and oregano. Simmer for fifteen minutes, and add the basil when the sauce is done (to preserve the fresh flavor). 3. Place the pan fried chicken on a parchment paper or foil lined sheet pan. Place a ladleful of sauce on the chicken, making sure to leave some of the crust exposed. You will have extra sauce, which can be frozen and used later. Place the mozzarella on the sauce, then sprinkle with the parmesan. Bake until the cheese is bubbling. You can serve this with any pasta, tossed with some of the extra sauce.